Our credit card processing module has recently undergone extensive beta testing and I am happy to announce that it has passed all the tests with flying colors! One customer has now been using the module and have processed almost 300 transactions. 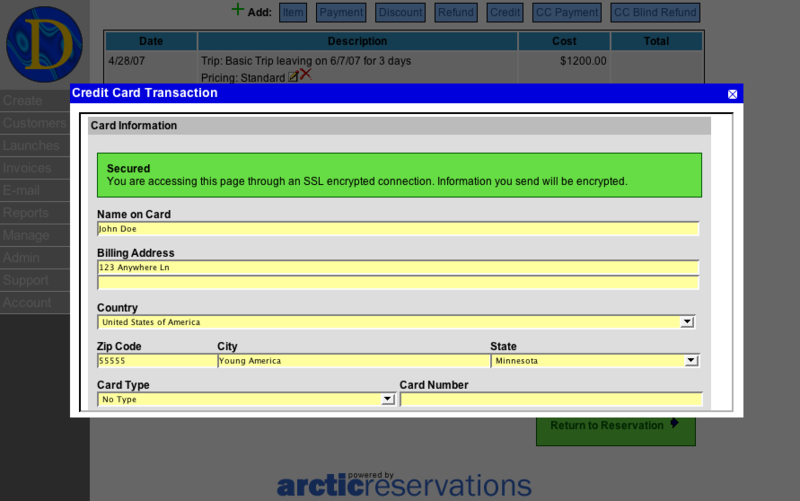 The credit card module allows you to seamlessly process credit card transactions within the Arctic Reservations software. This means that when processing a payment, you never have to leave Arctic Reservations. Just type in the card information and instantly get approval information from your processing bank. Upon approval, Arctic Reservations will automatically add a payment item to the invoice. And of course, when processing follow up transactions, you can easily access saved credit card information for the particular customer. And finally, the software offers extensive tracking and reporting information, as well as the necessary transaction tools to run refunds and void transactions that have not been settled. Of course, this has all been implemented with thorough security precautions. All transactions must go through 256 bit SSL encryption and data is properly and securely stored on the server. Finally, extensive logging is performed to make sure only authorized users access the transaction information. Currently, the credit card module has been setup to work with SkipJack as a payment gateway. This means that SkipJack will provide merchant services and act as a middleman between transactions performed within Arctic Reservations and your bank. Eventually, we will consider supporting additional payment gateways, but we judged SkipJack to be a good starting point as they offer low cost gateway services as well as reliable service. 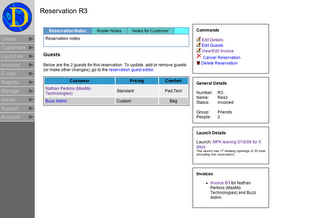 The reservation details page has received a design revamp. It now puts more focus on the essential data and provides a handy side bar with access to common commands and other important details. The new design embodies many of the principles that were used when creating the launch page that was implemented a few months ago. 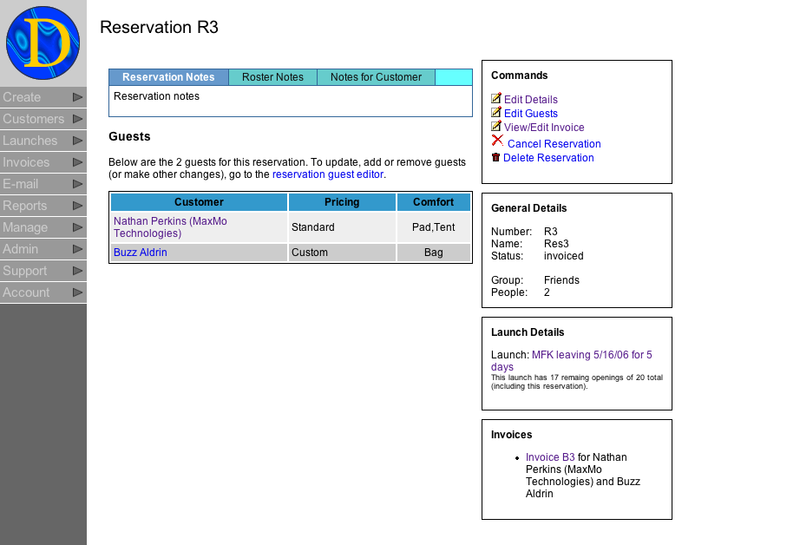 This update should ease access to reservation details. Below you can see an image of the new page. Arctic Reservations new template based e-mail system (which still is in beta) has been implemented throughout the site. The e-mail system allows for highly customizable HTML templates for sending e-mails… that means your e-mails can include graphics, custom attachments and many more features. In addition, the new e-mail system allows you to easily create the template in your favorite e-mail client and simply e-mail it to a special address. Then the site does the rest, turning your design into a template where content will later be added. Now, in addition to marketing e-mails, you can now use the new e-mail features in other parts of the site, such as when sending an invoice. And all e-mails sent will be logged for fifteen days, allowing you to view previously sent messages and resend message if they did not go through. The sent e-mail log can be accessed from the “E-mail” button on the left menu. Previously, the template based e-mail system was going to include tools for mass messaging customers. We are sorry to say that this feature has been removed. If the site was to include tools for mass messaging, we would run the risk of our e-mails being blocked by large internet service providers. We decided that it is more important that individual e-mails consistently get through (such as launch invoices and photo site invitations), rather then offering a mass message feature. Currently, customer information can already easily be exported and imported into third party e-mail messaging systems. A new module for Arctic Reservations has been released. The new guide scheduling module allows for easy management of guides to ensure proper scheduling. The new tool allows guides to be assigned to work on certain trips. Then, overall summaries as well as individual guide schedules can easily be printed. In addition, the module can enforce mandatory “off days” (days in between trips) to make sure a guide is not over schedule, especially on multi day trips where guides must be involved in turnaround activities. Finally, you can also easily specify a preferred guest to guide ratio, which the site will help you keep by highlighting trips with too few guides. This is just one of many modules available with Arctic Reservations. Such modules can easily be added on to an account to expand functionality, depending on the needs of your outfitter. The guide module can be seen when using the demo of Arctic Reservations. Existing customers may add the module by contacting sales.